The Trainersoft Manager 1.0 Learning Management System is the sister application to the Trainersoft Desktop Author. 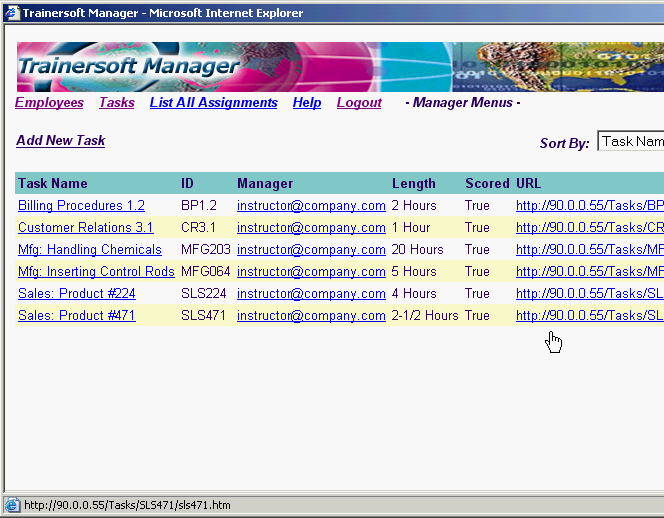 Manager allows companies to create lists of courses and assign them to individuals. Test scores are then tracked by the system. Manager 1.0 was written using Microsoft ASP (Active Server Pages), and used a Microsoft Access database, with the ability to use Microsoft SQL Server Database connection available as an option. It was designed and built using proprietary communication techniques that pre-date SCORM or AICC capabilities. Based on customer input, Manager 1.0 was rewritten by another team as a native ASP / SQL Server application. The Spectrum Research team designed and implemented the AICC tracking for Manager 2.0, and also participated in additional testing and bug fixing. Trainersoft is a registered trademark of Trainersoft, Inc. and Outstart, Inc.